SpaceX's first next-generation Falcon 9 rocket launches on its debut test flight from Space Launch Complex 4 at Vandenberg Air Force Base in California on Sept. 29, 2013. 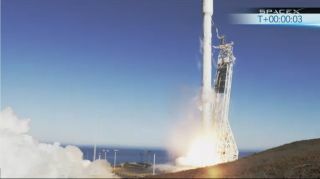 The private spaceflight company SpaceX launched the first of its new-and-improved Falcon 9 rockets from the California coast Sunday (Sept. 29), an ambitious test flight that also marked the company's first flight from the West Coast. The unmanned next-generation Falcon 9 rocket blasted off from SpaceX's launch pad at Vandenberg Air Force Base in California at 12 p.m. EDT (1600 GMT) carrying a Canadian satellite to track space weather into orbit along with three small satellites. A large crowd of SpaceX employees was seen cheering at the company's headquarters and rocket factory in Hawthorne, Calif., as the upgraded Falcon 9 rocket soared toward orbit. A camera aboard SpaceX's first upgraded Falcon 9 rocket shows the view down after launching from California's Vandenberg Air Force Base on Sept. 29, 2013. Sunday's launch marked the sixth Falcon 9 rocket launch for (short for Space Exploration Technologies), which was founded in 2002 by billionaire entrepreneur Elon Musk. But it was SpaceX's first flight to include major upgrades to the 22-story rocket, which is designed to launch the planned crew-carrying Dragon space capsule. One of those upgrades included an innovative addition to the Falcon 9's first stage, which SpaceX designed to restart after separating from the second stage to see if it could perform maneuvers during re-entry as part of a reusability test. SpaceX officials said the plan called for two first-stage engine maneuvers before the booster splashed down in the Pacific Ocean, but success was not guaranteed. "It is important to note that this is not a priority for this flight and SpaceX does not expect success with this first test," SpaceX spokeswoman Hannah Post told SPACE.com. SpaceX has been working to develop technology for a completely reusable rocket launch system. In McGregor, Texas, it has launched a novel reusable Grasshopper rocket prototype on several vertical launch and landing test flights. Sunday's launch was also the first time SpaceX launched a satellite into orbit instead of the company's Dragon space capsule. During the launch webcast, the Falcon 9 rocket's first stage appeared to separate smoothly from the second stage and fall away as planned. The second stage then ignited on schedule as the huge satellite payload fairing, which is large enough to house a school bus, separated to expose Canada's CASSIOPE space weather-tracking satellite. Built by the Canadian Space Agency, the 1,060-pound (481 kilograms) satellite will study how solar particles from the sun interact with Earth's atmosphere during space weather events. It includes special cameras to observe the auroras at the Earth's pole created by this interaction, CSA officials have said. SpaceX's Falcon 9 rocket is a two-stage launch vehicle that stands 224.4 feet (68.4 meters) tall and is powered by nine Merlin engines also developed by the company. The booster is designed to launch satellites into orbit, as well as manned and unmanned versions of SpaceX's Dragon space capsule. SpaceX has a $1.6 billion contract with NASA to use launch cargo missions to the International Space Station using Falcon 9 rockets and Dragon space capsules. The company is also building a manned version of the Dragon in a bid to launch astronauts into orbit for NASA. The Falcon 9 rocket improvements being tested during today's launch included a set of nine brand-new Merlin 1D engines arranged in a novel circular pattern — which SpaceX calls the "Octaweb" — that together can generate 1.5 million pounds of thrust in a vacuum, a 50 percent increase over previous Falcon 9 engines, SpaceX spokeswoman Hannah Post told SPACE.com. The new Falcon 9 rocket carries more fuel for those engines, is equipped with a triple-redundant avionics system, as well as a more durable first stage to help the booster better withstand its re-entry into Earth's atmosphere, she added. Polar Orbiting Passive Atmospheric Calibration Spheres (POPACS):A privately funded CubeSat mission to measure the effects of solar flares and coronal mass ejections on the density of Earth's upper atmosphere. Drag & Atmospheric Neutral Density Explorer (DANDE):A 110-pound (50 kg) spherical spacecraft developed by students at the University of Colorado at Boulder. The goal of the DANDE mission is to provide an improved understanding of the satellite drag environment in the lower-thermosphere. CUSat:A technology demonstrator developed by Cornell University. CUSat will use a new, relative GPS algorithm called Carrier-phase Differential GPS (CDGPS) that will provide accuracy to the millimeter level. SpaceX's Falcon 9 launch took place on a big day for commercial spaceflight. The rocket launched into orbit just hours after Orbital Sciences Corporation's commercial Cygnus spacecraft arrived at the International Space Station, capping its own test flight. Like SpaceX, the Dulles, Va.-based Orbital Sciences has a contract with NASA for unmanned cargo delivery flights. Orbital's contract is a $1.9 billion deal for eight delivery flights using the Cygnus spacecraft. With Sunday's successful launch test, SpaceX will turn its attention to its next launch. The company has at least three more Falcon 9 rocket flights planned for 2013, all of which will launch satellites into orbit for customers using the company's launch pad in Cape Canaveral, Fla.
Email Tariq Malik at tmalik@space.com or follow him @tariqjmalikand Google+. Follow us @Spacedotcom, Facebookand Google+. Original article SPACE.com.